Featured amenities include a library and refrigerator in a common area. Free self parking is available onsite. This lovely hotel is situated in Taos. The total number of rooms is 56. Pets are not allowed at Sun God Lodge. Dip into one of the 3 spa tubs or enjoy other recreational amenities, which include a fitness center. Additional amenities at this hotel include complimentary wireless Internet access, a fireplace in the lobby, and a picnic area. 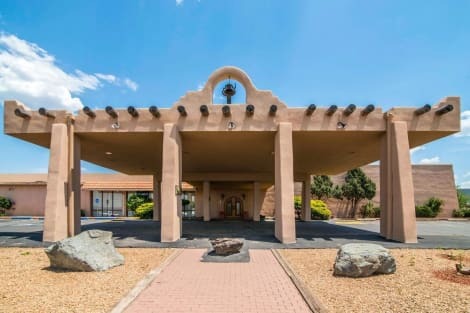 Located in Taos, Quality Inn Taos is in a rural location, a 5-minute drive from San Francisco de Asis Mission Church and 5 minutes from D.H. Lawrence Ranch. This ski hotel is 4.7 mi (7.6 km) from Taos Pueblo and 1.9 mi (3 km) from Navajo Gallery. Make yourself at home in one of the 44 air-conditioned rooms featuring flat-screen televisions. Complimentary wireless Internet access keeps you connected, and satellite programming is available for your entertainment. Bathrooms have bathtubs or showers and complimentary toiletries. Conveniences include irons/ironing boards, and housekeeping is provided daily. Spend the day on the slopes, or enjoy recreational amenities including an outdoor pool and a spa tub. Additional amenities at this hotel include complimentary wireless Internet access, a fireplace in the lobby, and tour/ticket assistance. Located on 22 acres and set in a historic hacienda built in the 1850s, Taos Country Inn is surrounded by trees and gardens. Taos town centre is just 2.8 km away. A TV and a fan are provided in each guest room at this B&B. Private bathrooms include a hairdryer and free toiletries. Deluxe rooms provide a seating area, a fireplace and a sofa. Guests have access to a garden and a terrace at Taos Country Inn. Other facilities offered at the property include meeting facilities. Horse riding, hiking, fishing and rafting opportunities are offered in the surrounding area. The Harwood Museum of Art is 2.3 km away from this property. Taos Pueblo is 5.9 km away. The property offers free guest parking. Featured amenities include a 24-hour business center, limo/town car service, and express check-out. Planning an event in Taos? This resort has facilities measuring 5955 square feet (553 square meters), including conference space. Free valet parking is available onsite. lastminute.com has a fantastic range of hotels in Taos, with everything from cheap hotels to luxurious five star accommodation available. We like to live up to our last minute name so remember you can book any one of our excellent Taos hotels up until midnight and stay the same night.